Who Killed the Solar Console? 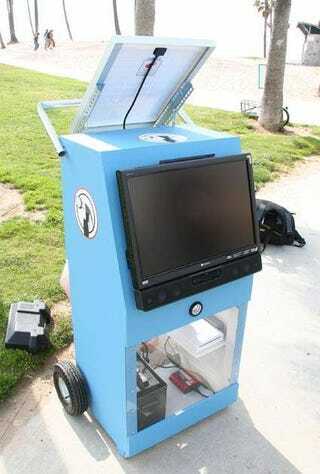 Three years ago someone built a solar-powered video game console. It was a novelty. You couldn't really say it was ahead of its time, because that assumes such a time will come. Built like the love child of the Zaxxon robot and a leaf blower, the unit - a solar-powered Wii - sacrificed plenty of practicality in the name of portable design and affordable parts. The 20-watt panel required some really long charging times for a battery that supplied eight hours of use. It was a nice demonstration of the utility of solar power at a time when mainstream media hype for the Wii was at its apogee. The idea never went any further than this, of course. It probably wasn't meant too. For all the memories of gaming as a leisure activity - ones we're definitely exploring in this week's Summer of Gaming theme - no practical relationship exists between video gaming and the sun. Not even an exploitive one. Gamers are not, by stereotype, sun worshippers. It's an indoor activity, assumed to be played in areas that get more subterranean, the older you get: family room, rec room, basement, "man cave." More than a few here in Oregon and the Northwest will confess to the usefulness of all-day rain as an excuse for staying inside with a controller in hand. Gamers may not be of a mind to embrace the sunshine; why can't their devices? "You should do it," says Dr. Frank Vignola. "Now, would it be practical? Probably not. It'd be quite the contraption." Vignola is an expert in solar research at the University of Oregon, who directs a solar radiation monitoring network comprised of 39 stations in the Pacific Northwest. He's been doing this for more than 33 years. He's a guy who knows his sunshine, in other words. But the ethical or environmental reasons of renewable, clean energy are only a small part of the argument for why this is an alternative power source with applications still useful to gaming - if not as a direct power source for a console. Photovoltaic cells can also power an uninterruptable power supply, although they're a more exotic source than the cheaper, commercially available UPSes you plug into line power. It's also more consistent, zeroing out the spikes that require surge protection measures. PV cells also produce direct current, which is what that giant brick for your Xbox 360 has to produce from the alternating current coming out of the wall. Finally, "People get tired of batteries and always charging things up," Vignola says. Solar cells have powered calculators for three decades, there might come a day when they're useful for peripherals, controllers and mice. The guys who built the Solar Wii followed it up with a Solar DS Lite, and solar's utility in portable devices might be a little more apparent than on a full console. "Those are things that can actually happen," Vignola says. "They're improving in efficiency, the batteries are smaller and contain more energy." It's a stretch to say that increases in household power demand track with the rise of things like video game consoles, Vignola says. People are using air conditioning a lot more now, and window units and heat pumps draw more power, and are operating more persistently, than game consoles, whose power draw is commonly compared to that of a city the size of San Diego. Further, those consoles are getting more efficient on the whole, Vignola says, although some - and some associated devices, like controller chargers, powered speakers, televisions and monitors - can draw an always-on "parasitic load" that's sizable considering it's basically wasted electricity. Nevertheless, there's such a basic goodness associated with the idea of any alternative energy source that it's amusing to run an indulgent, optional, indoors recreational activity like gaming up against the sun and find it completely unbeatable, by all practical arguments anyway. But that focuses on only one end of a gaming system. There's another, even more essential, component pouring tremendous amounts of energy into it. So, go out in the sunshine. Read. Relax. Lay on the ground. Or just spread your arms and soak it up, for a good long while. Then go back in, recharged, refreshed, and ready to play.